In the ramblin' dog motion you'll catch the scent of rich acoustic and electric textures with strong lyrics and honest vocals that take a wander through the back yards of love. A concept album! We began playing together as a duo in 1988, drawn to each others original songs and music. Both being Singer/Songwriters we bring our different takes on life and the emotions that arise in love, loss, children, old age, estrangement, forgiveness, injustice, redemption , cars, trains, planes and even phone lines, we sing stories that relate to our west coast lives. Some songs will break your heart while others will lift you out of this world. We made our first recording as a duo with "Eleven Eleven" in 2000 when we called ourselves Dusty Rose. After that Susan did a solo recording " Into The Midnight Waltz " and also sang with a womens accapella trio Bella, recording " Bare Feet ." 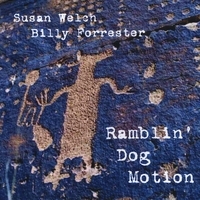 During this time Billy played with Singer/Songwriter Heidi Newmen and Cowboy singer TR Stewart and The Mean Palominos and played on TR Stewarts recording " Long Shadows "
We have been back working together since 2006 we are proud to continue with our new Album " Ramblin' Dog Motion." Recently recorded in Suquamish Washingtion ( across Puget Sound from Seattle ) at Canoe Journey's Studio live as a group with Billy Forrester on Guitar, Susan Welch on Mandolin, Justin Gelle' on Bass and Don Simms on Drums.